I am never scared before a race. Today I was scared. The weather forecast was for rain all day and a Southerly wind gusting to 50mph, and I was going to be running South. 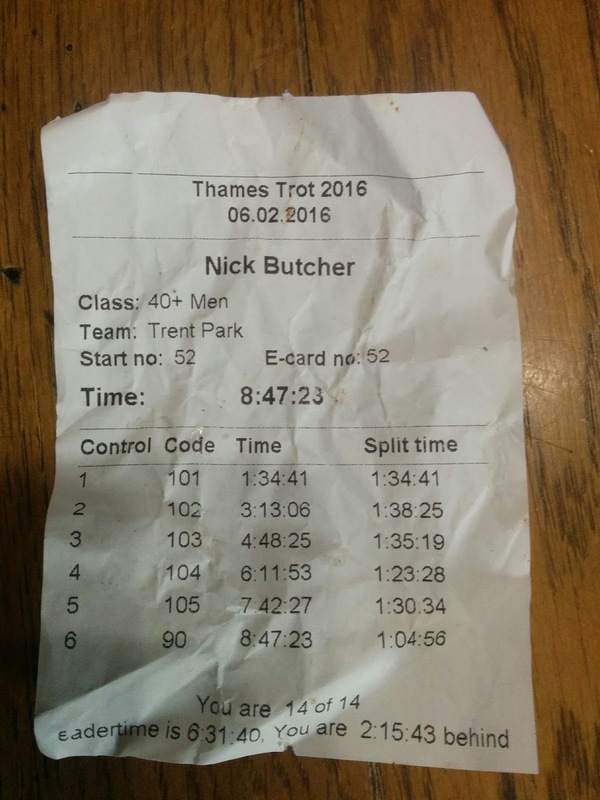 The Thames Trot Ultra was advertised as a 50 miler, but the official racebook had it as actually 47.1 miles. I wasn't going to complain, given the weather! At registration, instead of the usual race tshirt, I was handed a lightweight rain jacket, so thought I'd take a gamble and wear it instead of my rather heavyweight windproof anorak that I'd normally wear in these conditions. And I packed my spare lightweight rain jacket as backup. We set off from Iffley, just outside Oxford, briefly downhill on tarmac to the river, then onto the first of the mud. I enjoyed this section, settling into a relaxed pace, surrounded by plenty of other runners. Almost everyone was in rain gear and we were treated to heavy rain along this section. Underfoot it was at best wet grass and at worst sloppy mud. I wasn't certain the new jacket would stay waterproof, so I added my old one on top, bringing me up to four layers (tshirt and London Marathon reject long-sleeve top under the jackets). 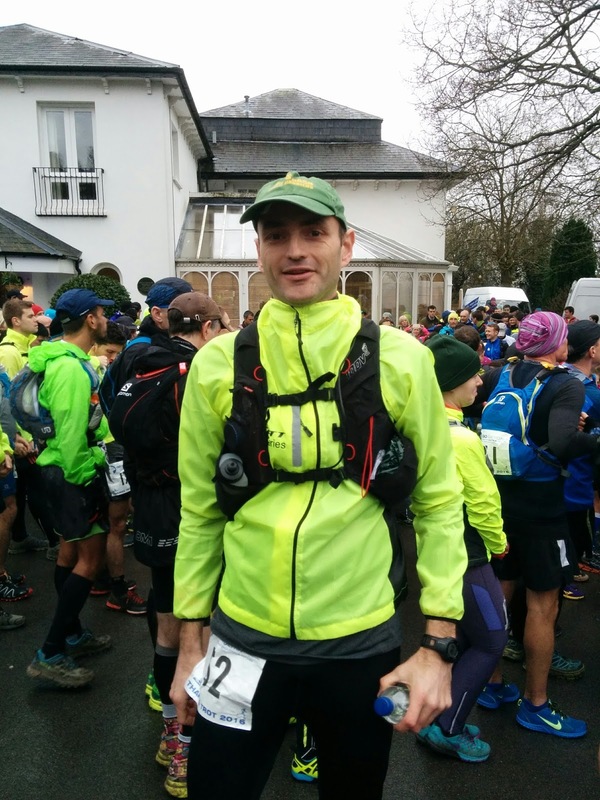 This section was done in 1:34 and I felt relaxed, refilling water and grabbing cake at CP1. Stage 2 continued on mud and grass, with a brutal section into the headwind after Clifton Hampden. The Thames gradually curves around to the south here and is very exposed. A brief stint on tarmac through Shillingford provided a welcome rest from the mud, before dropping back onto the towpath towards Benson and a quick stop at CP2 for another refill and a gel. 3:13 into the race now. Stage 3 began with a nice river crossing. There are some great footbridges over the weirs on the Thames, and you can feel quite exposed in the wind and the rain, with the river roaring underneath. Just a mile away was Wallingford, again a welcome change of scenery from the towpath, but only briefly. I was in familiar territory now - I had run down the other side of the river on the Ridgeway for the Druid's Challenge last year. The west bank was much the same - muddy and heavy going for what felt like a long time, until ducking under a giant railway viaduct and onto a main road. Again, this was short lived and I was soon alongside the Thames heading towards Streatley. Another refill and probably some cake (hard to be sure) and I was off again. I was now 4:48 and 27 miles into the race - just another trail marathon done and only 20 miles to go. Easy! I won't pretend it was easy. My pace had slowed now and I wanted to sleep. I chatted to a couple of runners and got into small groups on and off. There was a lovely section on harder trail uphill and through the woods away from the river at Coombe Park, before a road descent into Whitchurch-on-Thames. Over the toll bridge, past a few supporters and back onto more soft grass. I don't remember much of the scenery here - the wind was tough, it rained again, but someone had a pacer and he very kindly held all the gates open along this section! I think I had been going just a little fast here and the wheels fell off at CP4 where I drank a load of water, refilled and picked up another caffeine gel. Now 6:11 and 34 miles done. Only a half marathon to go! The next stage was a contrast from the rest of the race as it passed through Reading. It began with a small climb through Purley, away from the river. Again, tarmac made for a break from the mud but I was struggling for the first couple of miles of this section. I swallowed the caffeine gel I had just picked up, but it took a while to have much effect. The two other I'd been running with had disappeared ahead and out of sight and I plodded on alone. Down some steep steps over the railway back onto the towpath and it was now flat again. I can't recall if this was muddy or not, but it got more built up and was definitely a hard surface through Reading. King's Meadow was muddy, someone caught up and passed me here I think. I'd passed a few runners and a few had passed me, but I'd been running on my own since CP4. I don't recall much about the last few miles into CP5 and I was very tired when I arrived in 7:42. I dropped the banana they handed me, then wolfed it down, got a refill of Gu electrolyte and took a third and final caffeine gel. I passed a weary looking guy wearing a headtorch and walking. I wasn't going to bother with my torch this close to the finish. I crossed a field and was alongside the river for the final time, briefly over another of those footbridges right out into the middle of the river, but back onto the same bank, flying along on tarmac. It was very dark but I could see bright lights at the finish and picked up the pace, sprinting to the line to meet Claire and Arthur who were waiting for me! 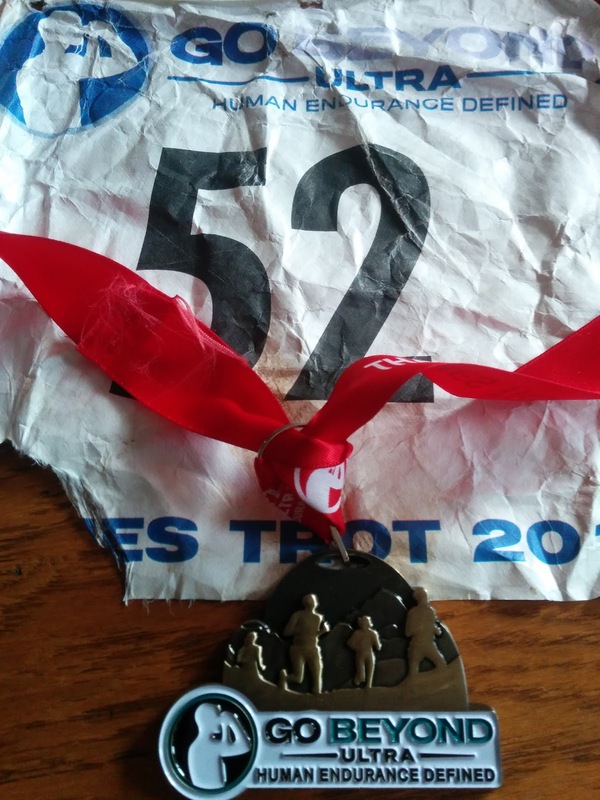 This was an amazing race, with brutal weather, relentless mud and great support and checkpoints. I am terrified at the prospect of coming back in April to run 100 miles on this route! 8:47:23 for my first race at this distance and it counts as my 96th marathon. Here is the route on Strava.